Monday was National Burger Day, and I had a block of gorgeous bleu cheese that we purchased from a local cheese shop. That could only mean one thing. 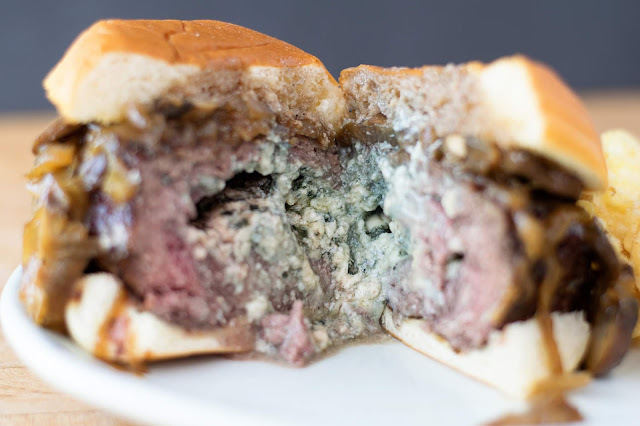 I HAD to make my Bleu Cheese Stuffed Burgers with Caramelized Onions and Mushrooms that I posted back in 2014. When I brought up the ORIGINAL POST I noticed that it needed A LOT of love not to mention I have updated the recipe quite a bit. So I am reposting the updated version here. I know you're gonna love it so ENJOY! 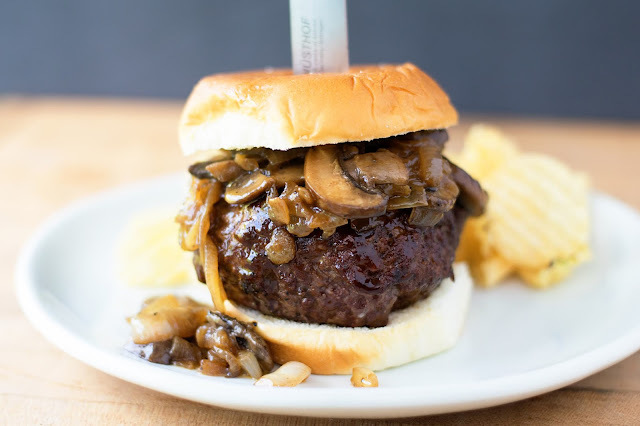 Before you begin prepping your burgers, you will need to caramelize your onions and mushrooms. You will need to melt your butter in a skillet over medium/low heat. One of the updates I made was the addition of mushrooms. 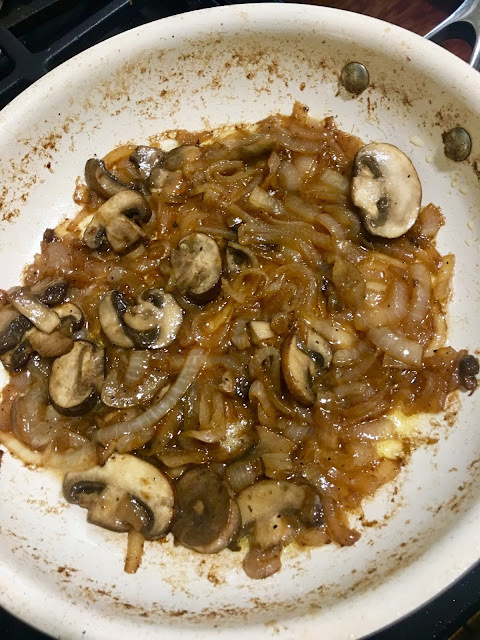 At the 20 min mark I add 2 Tbsp of butter to the pan and the 4 oz of mushroom. I let them cook with onions and it is DELISH! I also added a few dashes of worcestershire sauce for even more flavor! After that, he shapes the ball into a log and then separates the meat into two patties. 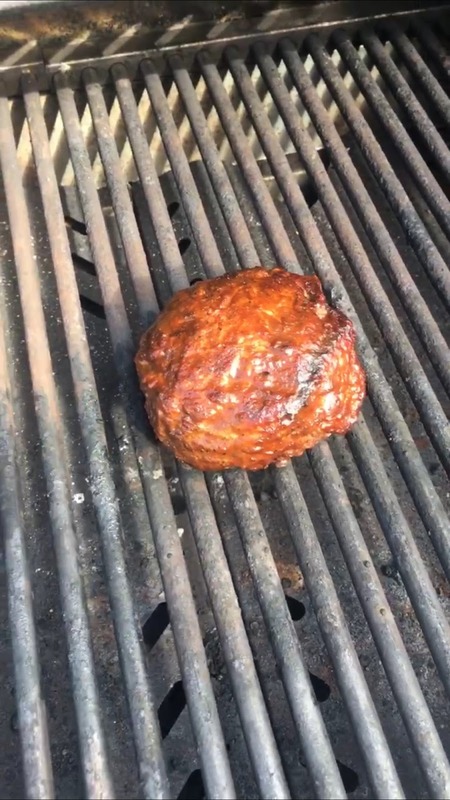 He adds the cheese to the center of the burger. DON'T skimp on the cheese y'all! Pack it in there! He brushes it down and, with an old towel, coats the grates with oil. Time for the second big update that I made to this recipe! Once I flip the burger I brushed a layer of A1 Steak Sauce over the entire burger! This just adds SO MUCH FLAVOR and it really compliments the bleu cheese! OH.MY.GOODNESS! How STUNNING is this burger!?! So this summer, don't get stuck grilling the same ol' burgers over and over. Get a little adventurous! 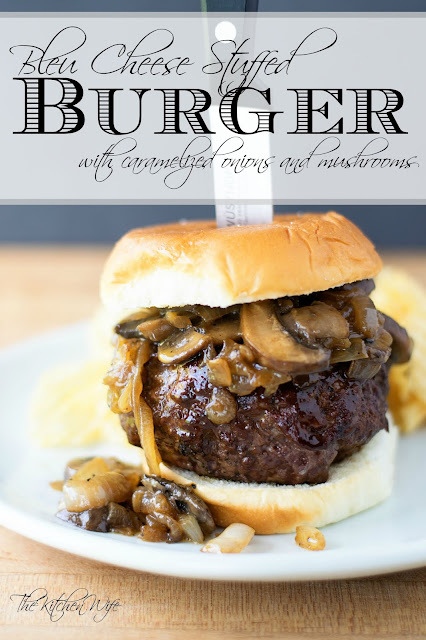 Give these delicious Bleu Cheese Burgers with Caramelized Onions and Mushrooms a whirl may just become a new family favorite! Cook for 30 minutes, over medium/low heat, stirring occasionally. At the 20 minute point add 2 Tbsp of butter and the mushrooms. Cook for the final 10 minutes. Press out into a thin patties. After you flip the burger baste with steak sauce. i'm seriously drooling over this recipe! Making it immediately!